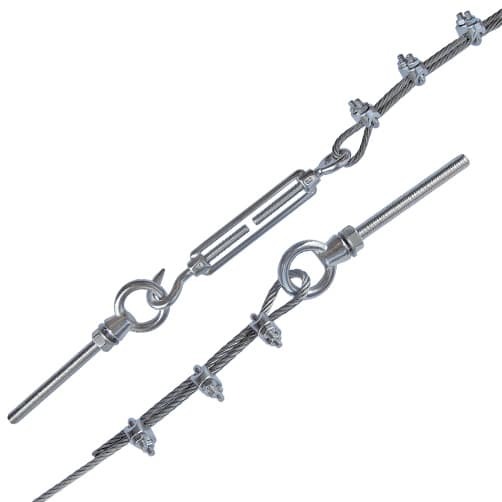 This standard catenary wire system is an ideal DIY kit with all the components and fixings required to install a hard-wearing overhead catenary into masonry and concrete that is built to last. 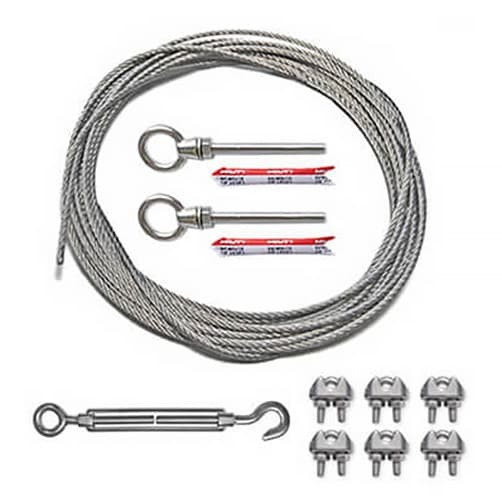 Please Note: This catenary kit is not load rated and is designed for light use within home/garden environments - not for use where safety/critical load bearing is required. 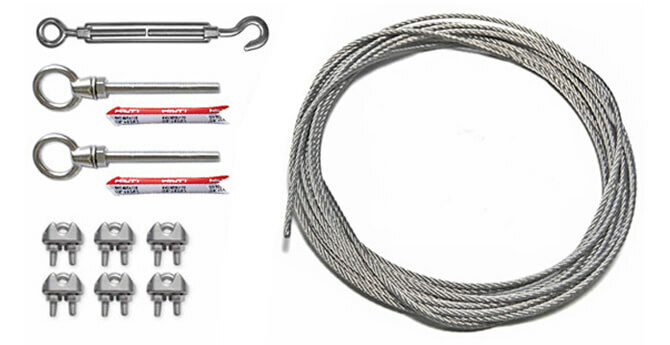 All components are manufactured from 316 (marine) grade stainless steel, making this kit ideal for harsh outdoor conditions. Power cables to sheds and outside buildings. Download and print our installation advice sheet for the DIY Catenary Wire Kit. Installation is straight forward with the use of a few household tools. You will need a drill, spanner, wire cutters and some chalk. 2. Drill your fixing holes and ensure that the holes are free from dust and debris. We recommend using a small brush and/or an air pump to perform this action. 3. Once you have done this simply insert one chemical anchor resin capsule into each hole. Insert your eye bolt, breaking the seal of the foil capsule to release the anchor resin. Remember to twist the eye bolt into place to ensure total coverage to provide a good solid fixing. 4. Leave the resin to set solid, making sure the eye bolt is flush to the wall surface. 5. We do not recommend cutting your wire cable to length at this point, as it can be trimmed to the correct length later on - Simply thread one end of the cable through the eye of your first eye bolt bringing it back on itself. 6. 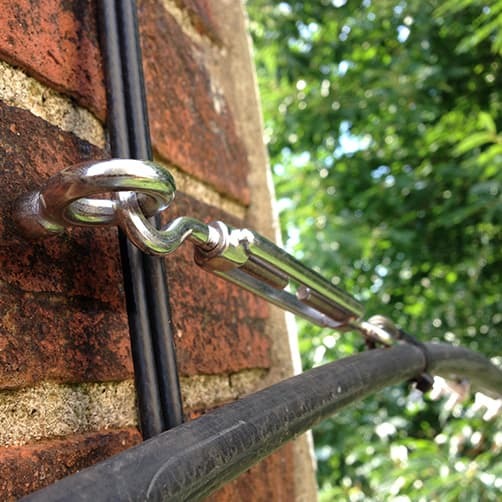 Using 3 wire rope grips - secure the wire cable to create a fixed loop. Starting approximately one grip base width in from the dead end of your rope place the U-bolt over the dead end and attach the grip base. Apply the fixing nuts - taking time to alternate between the two nuts as you tighten to ensure an even fixing. 7. Lead the loose end of wire over to the opposite fixing point. Attach the turnbuckle to the eye bolt (remembering to open the turnbuckle halfway - so that you can fully tension the wire by tightening the turnbuckle). Thread the dead end of the wire through the eye of the turnbuckle and tension as much as possible by hand. 8. 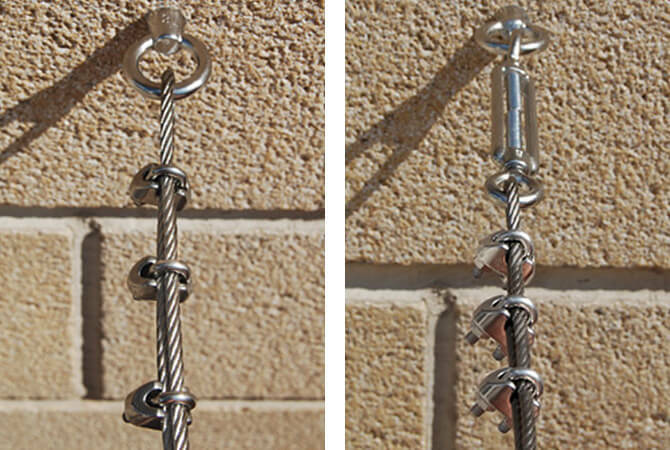 Using 3 wire rope grips secure the wire rope in the same manner as step 6. 9. Simply tighten the turnbuckle to achieve the desired wire tension.